Bo Zeigler holds the ball behind his head during a men's basketball game against Rhode Island in January. Former men’s basketball player Bo Zeigler signed a contract with the Radisson Red Glasgow Rocks for the 2018-19 season, the team announced Thursday. Zeigler spent his final year of eligibility as a graduate student at GW after three seasons with South Florida. 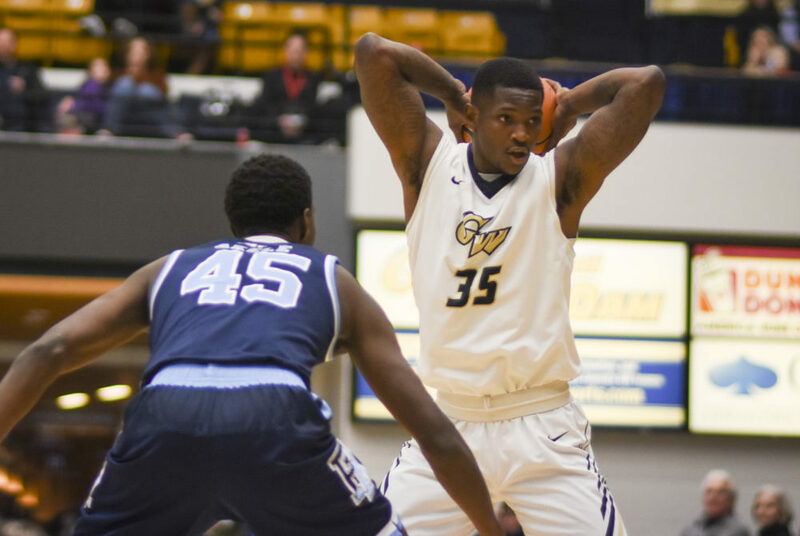 He played in all 33 games last season for the Colonials, averaging 7.2 points per game and 2.9 rebounds per game. In his only year as a Colonial, Zeigler shot a team-leading 62.6 percent from the field and collected 28 dunks to lead the squad. The 6-foot-6-inch big man was essential to the team’s only postseason win, dropping 16 points and grabbing seven rebounds in the first round of the Atlantic 10 Championship against Fordham. Glasgow is one of 12 member teams of the British Basketball League, the highest level of professional basketball in Great Britain. The league originated in 1987 and includes teams based in England, Wales and Scotland. The Rocks will tip off their season Sept. 21 against the London Lions.